U.S. Embassy Tokyo and the TOMODACHI Initiative, with dedicated support by MetLife Japan, launched the TOMODACHI MetLife Women’s Leadership Program (TMWLP) in 2013 with the objective to develop the next generation of globally active women leaders. The program aims to equip women with 21st century leadership skills, self-confidence, and the network required to successfully navigate their leadership journey in an ever-changing world. 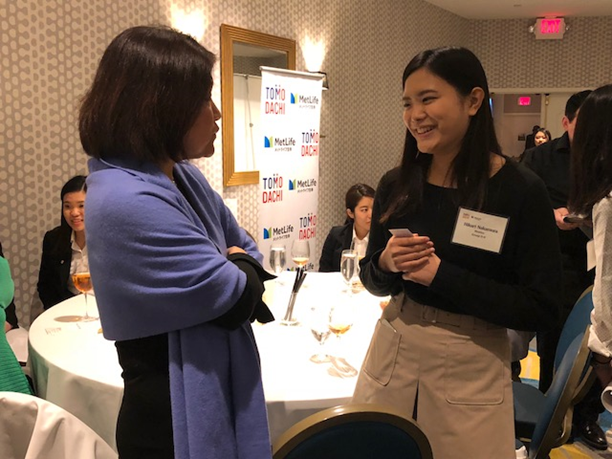 Through the year-long program, highly-motivated Japanese women university students work to hone their leadership skills. The students attend regular group sessions hosted by the U.S. Embassy that provide training in leadership development and financial empowerment by MetLife Japan. The students are also paired with female mid-career professionals as mentors to have one-on-one support and networking opportunities. Mentees also visit Washington, D.C. and New York for a weeklong study trip. Throughout the program mentees and mentors are invited to attend special seminars with members of government and business leaders. The TMWLP was originally held in Tokyo and Osaka and has expanded to include Naha, Fukuoka, and Sapporo on a rotating basis. The program is held in four cities each year. The 2018-2019 TMWLP program will be held in Tokyo, Osaka, Naha, and Sapporo. In the five-year period from 2013 to 2018, a total of 438 women (219 women university students and 219 mentors) have taken part. Accepted participants will be notified by August 17, 2018. Mentees must be Japanese citizens or permanent residents; available for the entire program; have intermediate English-language skills (the program is conducted in English); and interested in networking with other women, advancing women in the workforce, and making a positive change in Japanese society. Mentors must be Japanese citizens or U.S. citizens with permanent residency in Japan; available for the required sessions; intermediate English language skills (the program is conducted in English); and interested in networking with other women, helping to advance women in the workforce, and interested in helping to make a positive change in Japanese society. Committed to developing the next generation of women leaders by serving as a mentor and meeting on a regular basis with your mentee outside of scheduled leadership development sessions. NOTE: All dates are subject to change. All sessions occur from 18:00-21:00. March 20-29, 2019: Mentees travel to the United States. The program will cover travel and lodging. June 8-9, 2019: Mentors and mentees attend the capstone TMWLP Annual Conference in Tokyo. The program will cover travel and lodging for those participating in cities outside of Tokyo.